Minnesota is not in an earthquake prone area so I've never had an instrument fall off a rack. Except once. 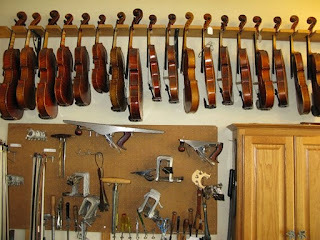 Several years ago, I had a client that was a middle aged man that had started the violin in his late 40s. Let's call him Mr. D. At first he rented a violin from us, then he purchased a nice intermediate level instrument. After a few years, he stopped in one day and said, "Andy, I'm getting good enough to hear the differences in violins. I'm ready for a really good violin!" I gave him several violins to play. After a short while he kept coming back to one German instrument from about 1870. He kept playing other violins and then going, "No, there's something about that old German violin that I really love." Eventually, he played through all the violins and kept coming back to that one. He spent most of the afternoon playing it. As he did, I could hear his playing improve dramatically and I could hear the violin opening up and really singing for him. At the end of several hours Mr D said,"Wow! I really love that violin. I mean, I REALLY love that violin. I want to buy it, but my in-laws are coming into town tomorrow and then we're all heading up to the cabin. If it's still here in a couple weeks when I get back, I'll know it was really meant for me." Two days later, I was opening up the shop as usual at 10AM. I opened the door and there was a violin that had fallen off the rack and crashed to the ground. The scroll was cracked. My heart sunk when I realized it was the violin Mr D had REALLY loved. Over the next few days, I did the best and fastest scroll reapir I had ever done. "Whew", I thought, "I'll need to tell him about the damage, but it plays as nice and sounds as good as it did before. Maybe he'll be happy. I can't ask for as much money." Days went by. Weeks went by. I didn't hear back from Mr. D. Another client played the violin and was interested in it. I explained how much Mr. D had loved the violin and that I wanted to at least call him before I sold it to anyone else. Luckily, the player understood. I called Mr. D's home the next day, and his adult son answered. I said who I was and asked to speak to Mr. D about the violin. His son said, " Yes, my dad was talking about that violin that evening. But I'm really sorry to tell you my Dad passed away." I was shocked! he was a pretty healthy guy as far as I knew. I said, "I'm so sorry, I really liked you Dad. How did it happen?" Mr D's son said, "Well, my dad went up to the cabin ahead of the rest of us to fix things up a bit. We got there at 10 the next morning. When we opened the door, there he was, dead on the floor." I again said how sorry I was and asked when that happened. His son replied, "Oh, it was just two days after he was at your shop." Two days after he was in the shop???!! That was the day the violin that he loved had fallen off the rack. The violin that he REALLY loved. I guess the feeling was mutual. And very close. And independently, both his family and I had opened the door, walked in and there he/the violin were on the floor! So, musical friends, it seems that, at least sometimes, we not only love our instruments and are deeply close to them but they return the feelings. 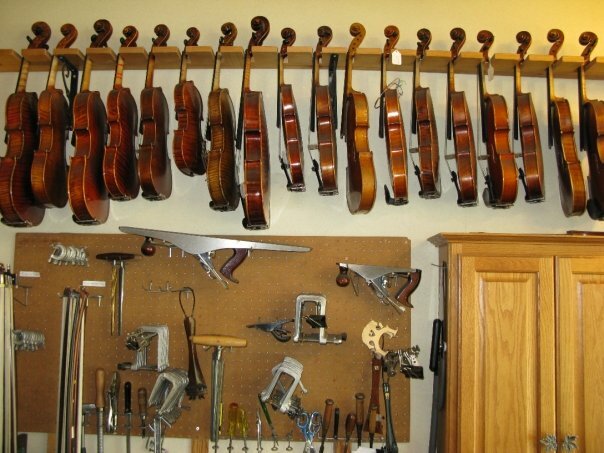 Take good care of your instrument!